A must have this colder season is the sweater dress. There is a sweater dress out there for everybody: long, short, tight or loose fitting, with a cowl neck or with a v-neck, made of big heavy knit or of lighter jersey. Remember to accessorize accordingly. Pair the sweater dress with colored tights and ankle boots for the look of the moment. And if you don't want to look too 80s, wear the dress with tights and a nice pair of shoes. hello :D i just stumbled onto your blog today and i must say, wow! how refreshing it is to see a fashion blog with affordable clothes that are still gorgeous! i think sweater dresses are the sexiest things ever! great blog! 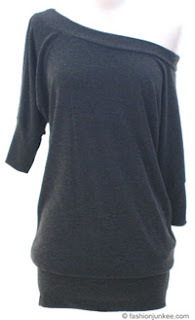 I just invested in a White & Warren cashmere sweater dress in chocloate brown with a back zipper. I was checking to see how to wear it.. boots tights, ect. Looks like you can go several ways with it. Thanks for the tips.